Seattle Sounders FC’s DeAndre Yedlin visited with youth soccer players from the Northwest Nationals Thursday evening in Mountlake Terrace. The Northwest Nationals youth soccer club, which is composed of players from Lynnwood, Edmonds, and Mountlake Terrace, won ‘Sound Off,’ a campaign by AT/T that challenged Washington Youth Soccer players to lead a no texting while driving pledge drive, and spread the word to family, friends and neighbors about the dangers of distracted driving. 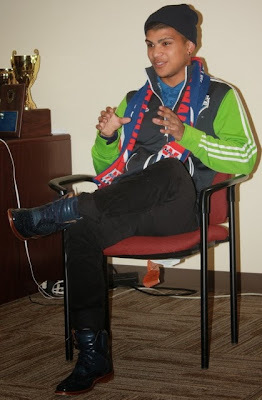 Yedlin, who grew up in Shoreline, took photographs, signed autographs and met personally with players from the Northwest Nationals – the youth soccer team that drove the most ‘It Can Wait’ pledges. from the Northwest Nationals to talk about the dangers of texting and driving. The Seattle Sounders FC and AT/T launched the ‘Sound Off’ challenge with the goal to create a social stigma around this dangerous habit of texting while driving, AT/T and the Seattle Sounders challenged the Washington Youth Soccer organization and its more than 115,000 members and 200 clubs across all parts of the state to get involved, spread the word and encourage their parents to take the pledge to never text and drive. As of today, the campaign has garnered 1,785 pledges to never text and drive. In addition to being dangerous, it’s also illegal. The state of Washington has banned text messaging for all drivers.